In a sparsely furnished office overlooking dozens of buses at the Zone 21 depot in Guatemala City, Jorge Castro flips through photographs on his mobile phone. He settles on one. “There’s the bus when I bought it in Maryland,” he says proudly. It is a blue and white bus emblazoned with the words “Ride On”, the name of Montgomery County’s public transit system. The same bus is now parked outside with a new paint job that reads “Transurbano”, the name of Guatemala City’s bus network. 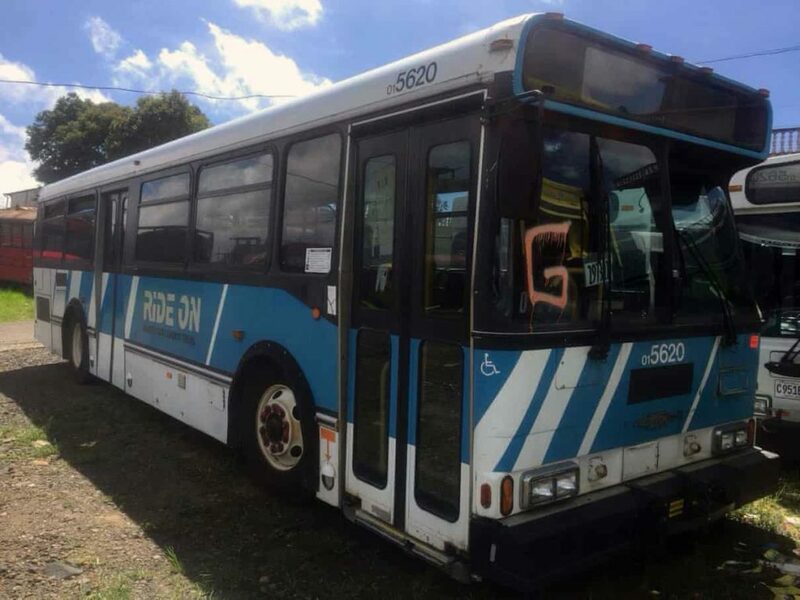 Castro’s job is to buy and refurbish used buses for the city’s bus lines. He bought the bus outside and seven others in 2017 last year from Maryland’s public fleet after they were phased out. He drove them to a New Jersey port and loaded them on a cargo ship bound for Guatemala. He also bought another dozen in Houston, Texas, which he drove south through Mexico, a three-day journey. Zone 21 in Guatemala City is one of the city’s roughest areas, though inside the bus depot it is quiet, with only the occasional buzz of machinery. Transurbano is part of the city’s efforts to modernise its largely unregulated bus fleet. For years, residents have relied on “red buses”: old American school buses painted bright red that are privately owned and largely unregulated. Drivers of red buses collect cash fares onboard and change their routes at will. Gangs have targeted red buses for extortion payments in recent years because drivers carry large amounts of cash, sometimes even killing drivers who don’t pay up.As a result, their owners often struggle to break even; buying new buses is out of the question. In contrast, private companies receive permits to operate Transurbano buses, and the new system includes prepaid fares, designated bus stations and established routes. “There are red buses on the street that are 30 years old,” says Castro. 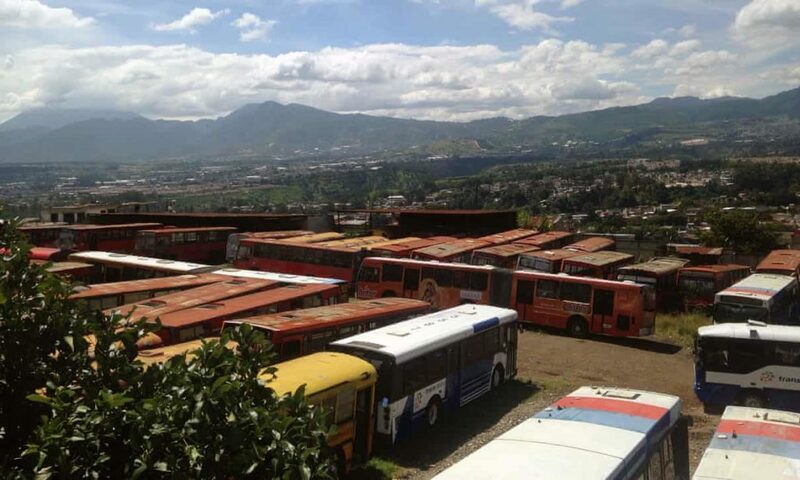 “We just restored some 1992 model red buses.” Guatemala has no regulations limiting vehicle emissions and it is common for older cars to remain on the road. Guatemala is not unique in this respect: a 2016 report from accountancy giant PwC found that in Nigeria, 11% of used cars are at least five years old, 26% are between six and 11 years old, 50% are between 12 and 18 years old, and 13% are over 19 years old. The bus depot in Zone 21 containing scrapped diesel buses from other countries. In an effort to modernise Guatemala City’s buses, operators like Castro must “trade out” a red bus for every Transurbano bus they put into the system. But that doesn’t mean the Transurbano buses are new. Originally, the city planned to buy over 3,000 new buses manufactured in Brazil. However, ultimately only 445 Brazilian buses were purchased and authorities subsidised bus operators to purchase their own buses – such as those from Maryland – to fill out the fleet. Outside Guatemala City, antiquated buses are the only public transportation option. Known as “extra-urbans”, these former American school buses are painted bright colours and travel between cities like Quetzaltenango, Antigua, and Chimaltenango. The narrow streets of Ciudad Vieja, an hour outside Guatemala City, are lined with automotive workshops that specialise in refurbishing buses for intercity routes. The intercity buses may be ornamented with chrome and elaborate custom paint jobs, but under the surface they are clunkers. 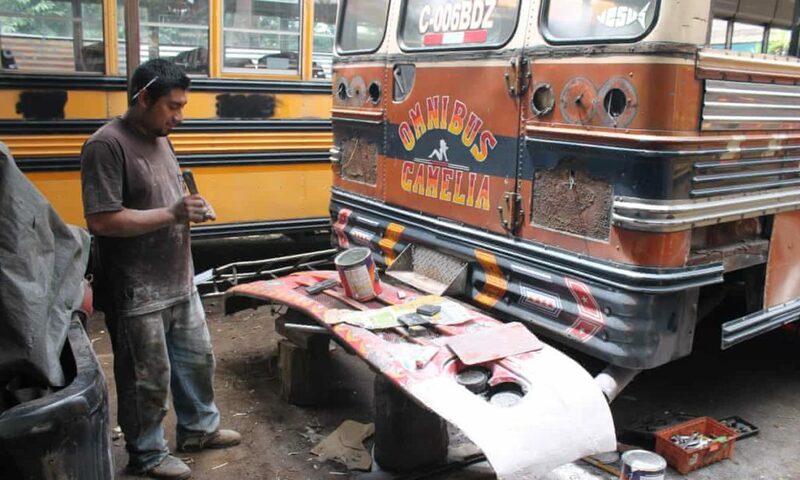 Antonio Estrada, a mechanic, says his workshop recently repainted a 1989 model bus that will go on to transport dozens of people on hazardous rural roads. Imported used vehicles are frequently modified, making safety features useless. In Guatemala, modifications to the engines, brakes and seating are a few potential safety hazards. Far from addressing the dangers of exporting clunkers, the US Environmental Protection Agency (EPA) under the Trump administration hopes to freeze fuel efficiencystandards at 2020 levels. Several states have said they will sue to block the measure. The EPA offers cash incentives to scrap diesel buses, but there is still a steady flow of vehicles heading south over the Mexico border, destined primarily for Central America. Mechanics refurbishing buses in Ciudad Vieja. Jamie Cooke, the fleet manager for Montgomery County, Maryland, oversees 3,800 vehicles, including 380 Ride On buses. Montgomery is trying to make its working fleet more sustainable; the county is in the process of transitioning its fleet from diesel to compressed natural gas (CGN) and electric vehicles (EV). Buses are phased out after 12 years, or 500,000 miles, per federal regulations. Vehicles are bought from the county by “GovDeals”, an auction site that sells former state and federal property – everything from buses to office supplies – to eager bidders all over the world. The UK also plays a role in the used vehicle market. According to the Centre for Remanufacturing and Reuse, 50% of British heavy vehicles reaching end-of-life are reused or resold in other countries after refurbishment. The CSE report makes many recommendations for both importing and exporting countries, including harmonising emission standards and fuel quality at the minimum level of Euro IV – which stipulates a maximum of 50 ppm of sulphur in diesel fuel for most vehicles – as well as age-caps and increased taxes on used vehicles. But even with tighter restrictions on used vehicle imports, demand for personal vehicles is on the rise in the developing world. In Mozambique, officials introduced a law in 2007 to discourage importing clunkers, but it was abandoned after public protests. At the automotive shop in Ciudad Vieja, Pablo Ramos, who owns a bus line operating between Quetzaltenango and Guatemala City, is waiting for the mechanics to finish working on one of his buses. In the meantime, these clunkers will have to do.